Remember when we made our gold fish? Well that got my thinking. Why couldn't we just change the recipe up a bit and make a couple of different versions? Of course we can so, here you go. Mix flour, baking soda, butter and tomatoes in the food processor. Then add water, a little at a time till it starts holding together. You don't want it sticky, so don't add too much water all at once. Once you have a nice dough formed, sprinkle counter with a little flour and roll dough out to about 1/4 inch thick. Place cutouts on cookie sheet lined with parchment paper. Then brush each cutout with a little bit of olive oil and sprinkle with sea salt. Bake in 375 degree oven for 15 minutes, or until they start to turn a golden color. Mix cheese, butter, flour, salt and garlic powder in food processor. Then add water a little at a time till it starts holding together. Once the dough is formed, sprinkle counter with a little flour and roll dough out to about 1/4 inch thick. Place cutouts on cookie sheet lined with parchment paper. Bake in 375 degree oven for 15 minutes, or until they start to turn a golden color. Both of these crackers were delicious, and each had a very different flavor than the other. We had them with tomato soup and they were amazing!! 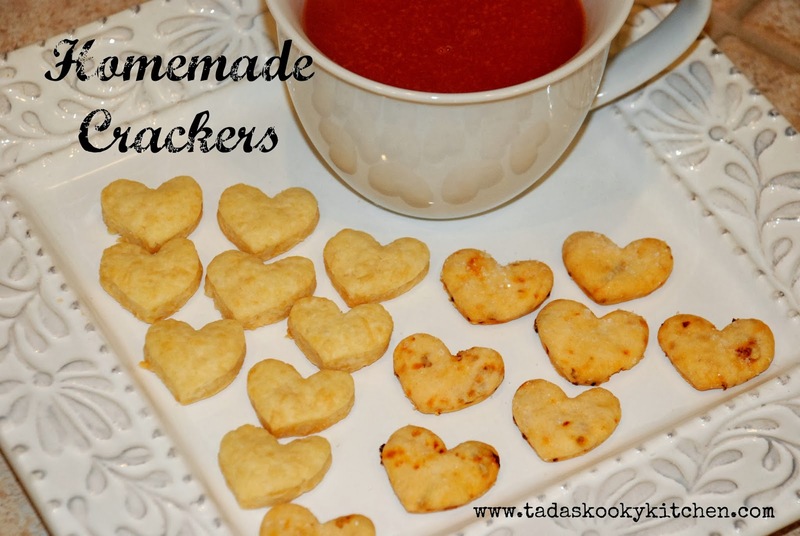 We made them using our mini heart cookie cutter. My instructions on how to make mini cookie cutters can be found here. Enjoy!